Ilkley is a wonderful little spa town in North West Yorkshire and a popular destination for tourists visiting the Yorkshire Dales. It’s particularly notable for its quaint tearooms, beautiful countryside and challenging rock climbing opportunities. The town itself is well populated, with approximately 15,000 residents. Recently, I visited one of the homeowners in the town who was in the process of selling the house. 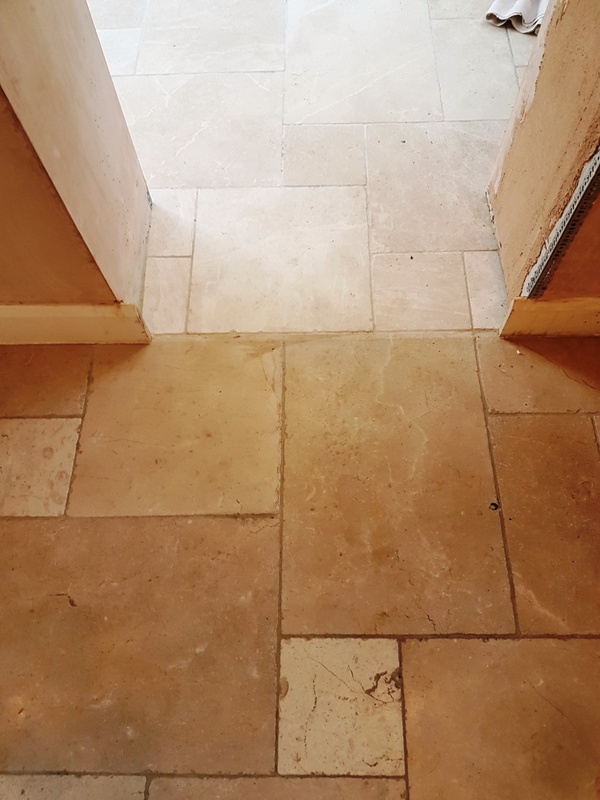 To help make the house more attractive to potential buyers they wanted to make sure the Cream Limestone tiles laid throughout the Kitchen and Dining room were in the best possible condition. The floor was comprised of four different sizes of Limestone tile, laid geometrically. The floor had originally possessed a natural matte finish, but a satin sealer had been applied at some point in the past to enhance its appearance. 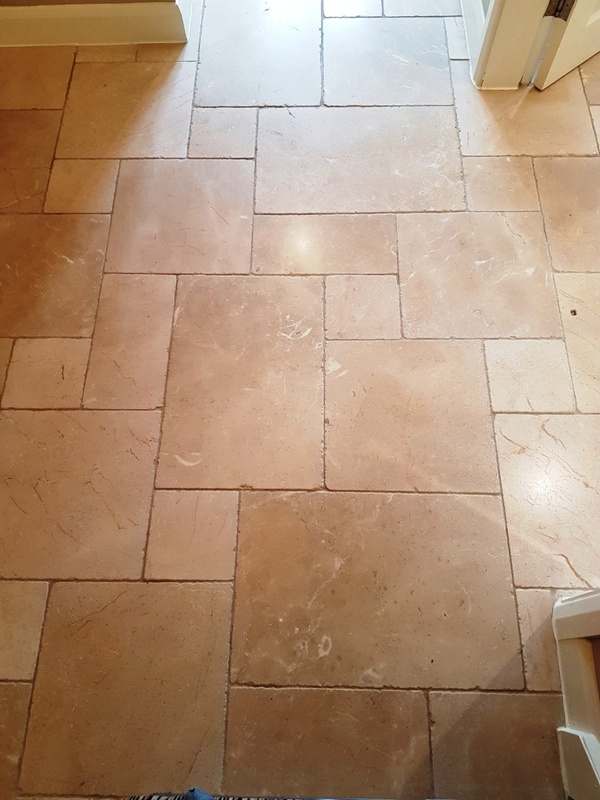 Over the years, this sealer had worn away and the Limestone had become dull and dirty, especially in the high foot traffic areas. The grout was similarly in a bad way. I spoke with the property owner about the options for cleaning the floor, outlining the merits of a restoration using our Tile Doctor burnishing pad system, a process which involves polishing the tiles with special diamond encrusted pads of various grit levels. The result would be a high-quality finish which could subsequently be preserved using a sealant. I felt it was the best course of action to restore the appearance of the Limestone tiles. Even though the customers didn’t want to spend a lot (understandable as they were moving out), they agreed to proceed. 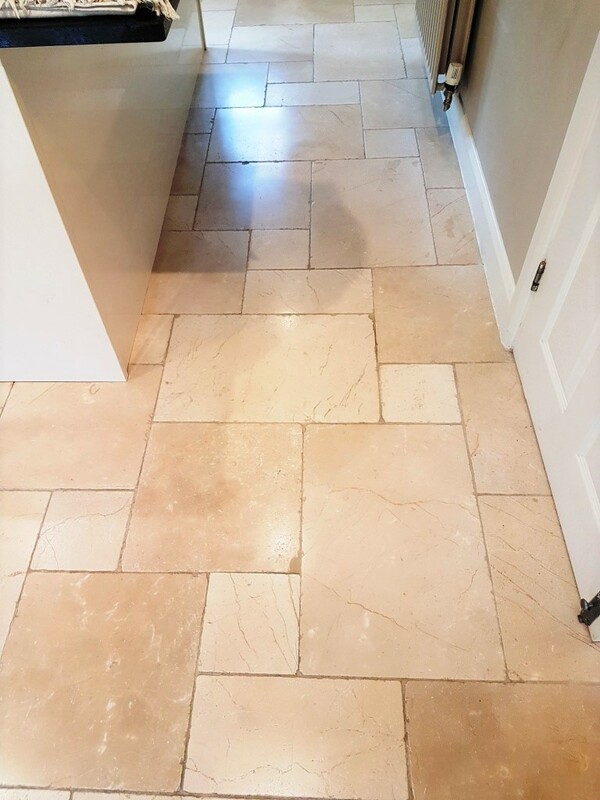 I started the restoration by cleaning the grout lines with Tile Doctor Pro Clean, which is a suitable alkaline-based cleaner for natural stone tiles and grout. The product was scrubbed into the grout lines with a stiff brush. 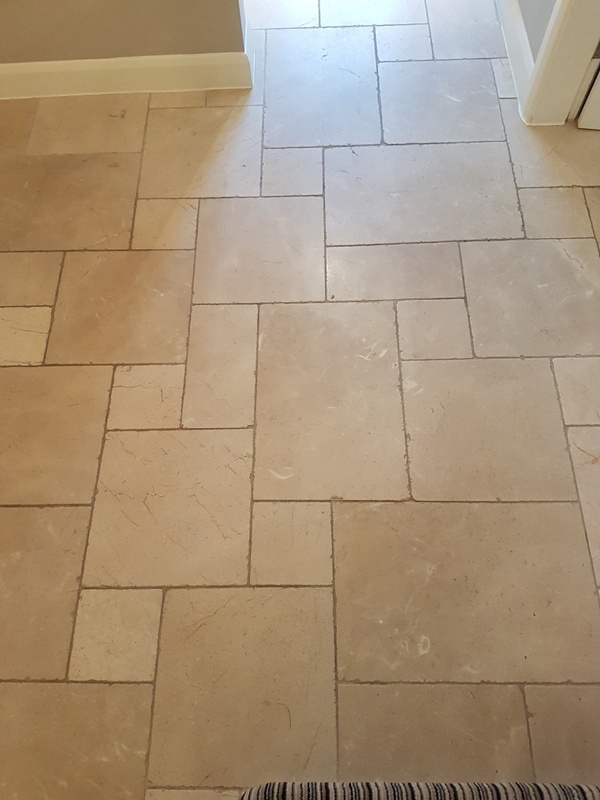 Once I was happy that the grout had been completely cleaned of any soil, I rinsed the cleaning solution away and extracted the slurry using a wet vacuum. The next step as to apply each of the four diamond encrusted burnishing pads in the Tile Doctor system. In this process, we start with the Coarse grit pad to grind away the very top layer of the dirty stone. We then move through the system to apply Medium, Fine and finally the Very Fine pad to gradually refine the polish on the floor. Each pad is used with a small amount of water for lubrication. Since this was a large area to restore, it took around two days before the grout cleaning and tile burnishing work was completed. Some fabulous results were achieved by the burnishing work, and I came back on the third day to seal the tiles with Tile Doctor Ultra-Seal. Ultra-Seal is a natural-look impregnating sealer that will protect the floor for some time to come. The customers were so pleased with the outcome that they even joked that they no longer wanted to move! I’m glad that they are happy with the results and I’m sure the new property owners will be too.